Timberwolves forward Kevin Love grabs a rebound in the first quarter against the Dallas Mavericks at Target Center. 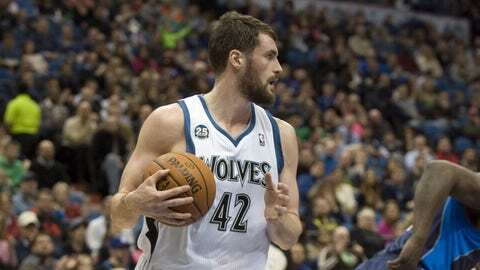 MINNEAPOLIS — When the Timberwolves gathered for a light practice Tuesday, coach Rick Adelman and star forward Kevin Love both shook their heads in unison. Adelman had just told Love the NBA acknowledged a botched no-call that could’ve altered the outcome of a 100-98 loss to Dallas on Monday night at the Target Center. Then, as quick as the topic was broached, the pair did their best to move on. "It’s like moral victories," Love said when asked if it meant anything the league pointed out its officials’ mistake. "You don’t really count those. It’s just something that we’ll just get past." Said Adelman: "It’s over with. It doesn’t do any good to think about it now." NBA president of basketball operations Rod Thorn issued a statement Tuesday morning saying Shawn Marion should’ve been whistled for reaching in and smacking Love’s arm as Love arose for a long 2 with time ticking down in the fourth quarter. Had referees Ed Malloy and David Guthrie made the correct call, Love would’ve gone to the free-throw line with a chance to send the game to overtime. "Through postgame video review, we have determined that Love was fouled on the right arm by Marion," Thorn’s statement said. "Love should have been awarded two free throws with one second left on the clock." As it stood, the Timberwolves fell to 0-5 in the month of December when trying to eclipse the .500 mark. Love was visibly irked Monday night following the sequence. "You saw the replay," he told reporters. Adelman was even more upset. "He got fouled," the coach said immediately after the defeat. "I wonder what that would have been if (Dirk) Nowitzki, LeBron James, all the top players in the league — a guy reaches on a last-second shot like that, instead of challenging it. Maybe they don’t understand that Kevin is one of the top five players in this league." Some speculation arose that Adelman would draw a fine for his criticism of the officials, but as of Tuesday afternoon, no discipline had been announced. It’s not the first time the NBA’s apologized to Minnesota for goofing up a late call. Last March, the league admitted Ricky Rubio should’ve been awarded three free throws when Kobe Bryant hacked him on a potential game-tying 3-point attempt. Malloy and Guthrie — both of whom appeared to have a good look at the play in question — may not have done Minnesota any favors Monday, but neither did the Timberwolves themselves. They trailed by 19 at halftime and 21 early in the third quarter, went 6-for-23 from beyond the arc and got a whopping five points from their bench. While the no-call hurts, Rubio said, it shouldn’t have ultimately mattered. "Sometimes, it’s even more frustrating," Rubio said. "We can’t do nothing. If they didn’t call it, they didn’t call it. That’s it. We don’t care if they say it was a foul or not. They didn’t call it. We didn’t have the chance to tie the game, and we lost that game. "Of course, you only focus on the thing that could change everything, but there’s little details that we could’ve done that didn’t put us in that situation. The first half, it was terrible. We aren’t gonna blame the ref for that game." Minnesota returns to action Wednesday at home against New Orleans.